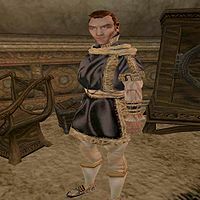 Malpenix Blonia is an Imperial trader who has a shop inside the Redoran Council Hall in Ald'ruhn, where he sells all manner of goods to all visitors (House Redoran members will get better prices, of course). He will donate 10-20 gold during the Buckmoth Alms quest. Buckmoth Alms: Visit the citizens of Ald'ruhn and collect donations for the Cult. This page was last modified on 23 March 2015, at 17:21.